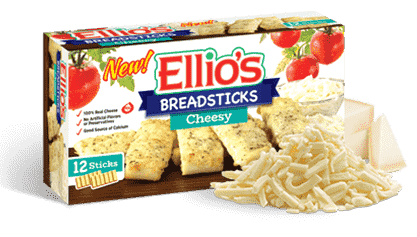 Ellio’s hasn’t changed one bite since you enjoyed it growing up. What you loved about it then, your kids will love about it now. So pass it on. 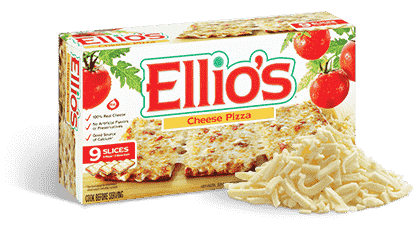 Over 50 years ago, Ellio’s introduced its rectangular slices to perfectly fit the lunchroom tray. Today, it’s still made with the same 100% real mozzarella cheese; real, crazy, savory sauce and 4-corners of wholesome, crispy, crunchy crust. 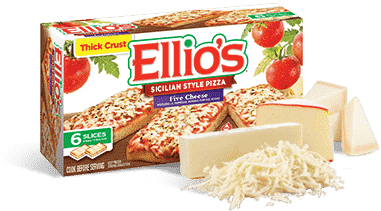 Ellio’s Sicilian Style Pizza combines the taste of Ellio's classic sauce and 33% more cheese with a delicious, thicker crust that is both crispy and crunchy on the outside, and deliciously light on the inside. They’re the latest way to love your Ellio’s! Available in real, jaw-droppin’, eye-poppin’ flavors like Cheesy and Parmesan & Garlic. Each box rocks with twelve 4-cornered Breadsticks. Open Wide!